Traveling with makeup can often times be a chore. Airport regulations are usually the least of your worries because the main concern is actually how you’re going to fit everything in your luggage without breaking anything. There’s nothing worse than reaching into your bag to look for an eyeshadow brush only to dig through layers and layers of palettes and mirrors and bigger brushes. 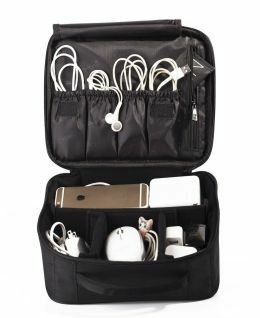 Although there are numerous types of makeup travel bags on the market, some of them are not built to travel. 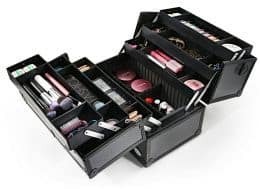 A makeup train case is your best bet if you are looking to keep your makeup organized and carry them without worrying about any spillage. It shouldn’t be so difficult to simply find what you’re looking for, right? The correct train case, that’s built with makeup storage in mind, can do wonders. 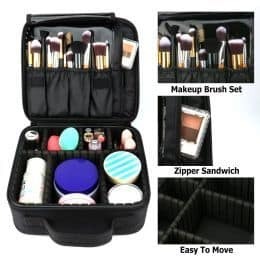 So here’s a list of ten best make up train case that will make your life a whole lot easier. Structurally, this bag from Rownyeon has it all. It is made of top grade oxford fabric and a japan imported zipper. At just 9.8 x 9.1 x 3.5 inches, it’s compact enough to store anywhere, but big enough and spaced out enough to put all your makeup essentials inside. Rownyeon is crafted to be able to store your makeup palettes, foundations, and brushes galore. When opened, it showcases three distinct compartments. One plastic brush holder set, a high quality plastic cover, and an inside pocket. Thick sponge all around adds protection in the form of waterproofing the bag and also creating an anti-shatter environment for the makeup. This bag is shake-proof and waterproof and is worth the investment. Check out the video below to see the case. Relavel is a little larger than the previous option, measuring up at 10.3 x 3.6 x 9 inches, it has a brush holder set, a plastic zipper compartment and then a large, main compartmentalized holder at the base. The interior and exterior are made from high grade Oxford fabric and nylon lining. The compartmentalized base is customizable, so you can add and remove sections as you please. The waterproof bag lets you store even oils and other liquid makeup items as it has a shock-proof and spill-proof design. The spill- proof interiors with padded dividers ensure that you don’t have to worry about any spillage. It seems that aluminum is the most popular stronghold for larger makeup storage units and Joligrace is no exception. The exterior is reinforced with aluminum that has been oxidized to look black. The main surface is laminated with PVC and actually has an embossed diamond finish pattern on it. Inside, you’ll find 6 trays made with enhanced plastic and a huge bottom compartment. The trays are all adjustable as expected. It comes with 2 locks and keys if you want extra protection from other than the latches. The size of the case is 14 x 11 x 10 inches which is large enough to hold all your makeup accessories. The main handle is padded as is the shoulder strap for ease of transport. Previously, variations on bags and cases were primarily in their size and shape. However, Monstina offers users a unique variation of strap usages. Whether you want to carry it around as a backpack, or you want to let your shoulders do all the heavy lifting, you have both options as well as a third. You can use the slider in the back to attach your bag to a carry on bag. This brand boasts high testing standards and top notch materials. The size of the case is 16.5 x 11.4 x 5.5 inches. Again, made with special nylon fabrics, the unit is waterproof, lightweight, built to last, and easy to clean. The adjustable dividers are all padded to allow for easy customization. 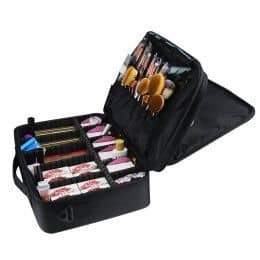 What’s great about Caboodles makeup case is that it combines the small size of the more casual makeup storage units with the holding space of the major storage units. You get the best of both worlds here with the bag being a mere 11 inches tall. It opens up however, to reveal a cascade of drawers. The Caboodles train case has 6 cantilever trays that makes organizing much easier. Three drawers on each side, two on the left and right and one large unit at the base give way to 9 huge compartments. The Caboodles makeup case has a luxurious look and feel due to its black lace over silver exterior finish and is one of the best professional makeup train case. Whilst the previous models have been somewhat small and handy, this one isn’t even considered a bag. It’s more similar to a giant suitcase. If you’re a professional makeup artist, or just a makeup junkie that takes your makeup storage and transport seriously, then Lenubo Glenor is the best cosmetic train case for you. All their dividers are removable and can be customized to taste and needs. The overall dimensions are 14 x 8.5 x 11 inches. The sturdy case comes in a high quality aluminum frame with reinforced steel corners and contains 16 compartments. It has 4 smooth hinged pull out trays and 2 dividers in each tray. A shoulder strap and handle make Lenubo versatile and easy to carry. It comes in silver, pink, or black exteriors and has an anti-scratch feet as well. 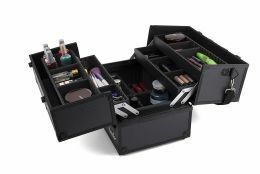 The Lenuba Professional makeup train case has ample number of customizable dividers with 2 metal latches with key locks on top. The Shany Essential Pro cosmetic train case opens up to a beautiful 4 drawer, two major compartment and 16 sections of space. Each compartment is lined with non-toxic ABS plastic as well as dust proof fabric to allow for longtime wear and usage. The bottom layer can actually fit a flat iron or dryer. Other than a large amount of space, the handles are reinforced to be comfortable, and soft. The shoulder strap allows for portability without compromising on comfort. It’s available in numerous patterns and shades too. What might stand out about this brand is that it offers a warranty on its products and it is also a member of PETA. This means that the product is cruelty free. The case measures 14 x 9 x 10.5 inches. Songmics make up train case is similar to Lenubo in that it is curated for a larger makeup load. 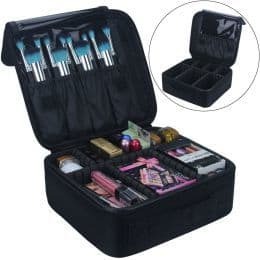 Fortified with an aluminum alloy shell, polyester silk cloth lining and ABS dividers, this professional grade makeup case boasts 4 extendable trays with 12 DIY compartments as well as 2 locks to protect your stash. Each hinge attachment is high quality and durable, you don’t have to worry about your box falling apart. The large case has a dimension of 13.4 x 8.6 x 9.5 inches. Once opened it reveals two sets of compartmentalized wings and sections made with non-toxic plastic. The interior is lined with a soft, foam like material that is shock absorbent and dust proof. 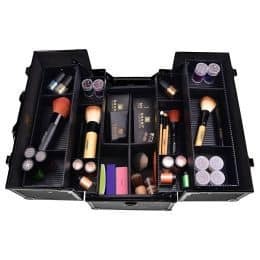 Easy to open, strong, and secure, this professional makeup box is perfect if you’re a freelance makeup artist and need to be certain your high quality makeup will stay safe and secure. Weighing in at just 1.5 pounds, Esarora cosmetic train case measures just 9 x 10 x 3.5 inches. Like the rest, it is manufactured with high grade Oxford fabric and nylon which helps make the bag waterproof, shake proof, anti-wear and spill-proof. According to the brand page, the brush holders and fit 7 inch makeup brushes and 3 inch lipsticks. The interior dividers are all customizable depending on how much space you require. The 6 adjustable EVA dividers lets you adjust the compartment sizes with ease. The bag is available in black or purples shades. 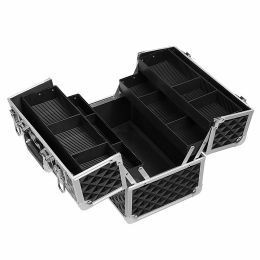 Although not made of metal like it’s large brethren, Relavel professional make up train case is loaded with space for all your makeup. Coming in at a whopping 1.6kg, it measures 16.5 x 11.4 x 5.5 inches. This bag comes with three distinct layers and includes 6 elastic band storages, 12 elastic pockets, a zippered mesh bag, and movable partitions and dividers to give you the freedom to arrange your makeup the way you need to. As it is made from premium nylon, its waterproof, spill proof, durable as well as light, and it is easy to clean. Made perfectly to sit atop your carry on suitcase, Relavel is revolutionizing the travel makeup lifestyle. When it comes to makeup, you have to be careful of leaks, spills, and breakages when you are travelling. 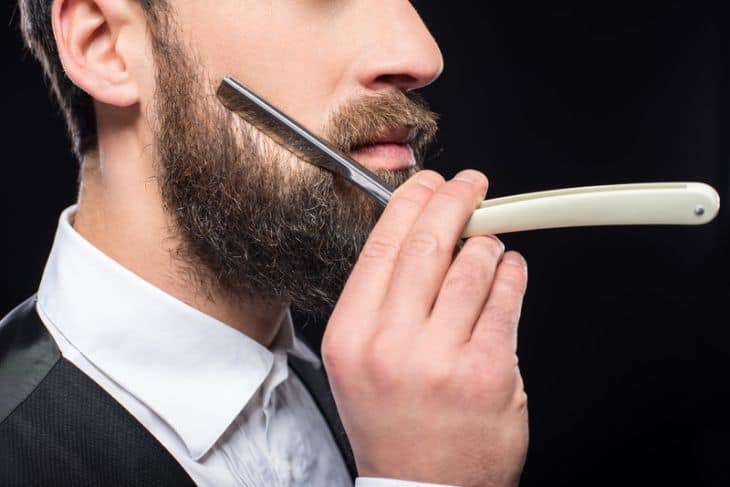 You want to attempt to do all this without compromising on comfort, quality, and ease of customization when needed. 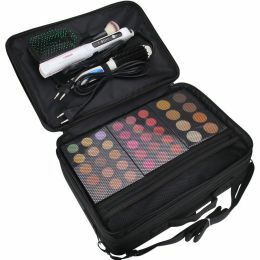 Our choice for the best makeup train case is Rownyeon that has all the bells and whistles at a good price point. If you are looking for a professional train case then the Caboodles stylist case is a good choice. Hopefully one of these options stands out to you, whatever your needs may be.